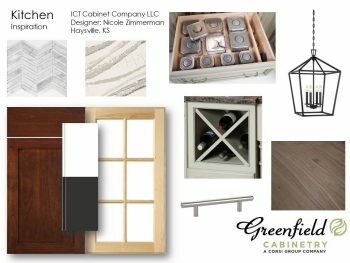 Greenfield designer, Nicole Zimmerman of ICT Cabinet Company, LLC, located in Haysville, Kansas shares her inspirations for a recent new construction kitchen. 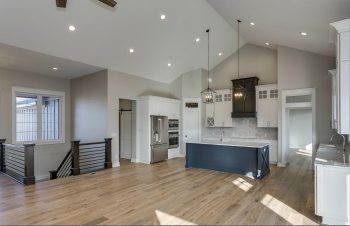 According to Nicole, the design of the kitchen is inspired by the modern-day farmhouse style. “I immediately pictured a fresh, airy Cape Cod inspired look,” says Nicole.  The shiplap island back and X island end caps are popular design elements to any nautical or farmhouse design. To create an open kitchen design, she utilizes the 120”ceilings to the max by adding 60” high wall cabinets. 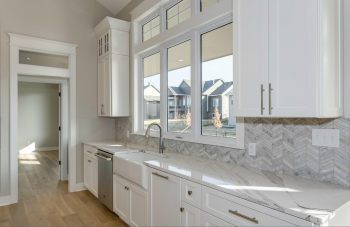 The stacked mullion doors on top mirror the window design above the white porcelain farm sink. 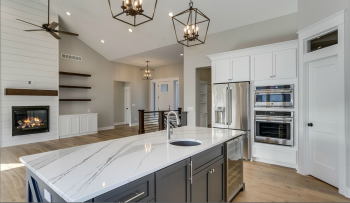 The kitchen design allows ample room for seasonal cookware storage, and other items not used on a daily basis, as well as space for everyday use items. In the island, Nicole adds a wine refrigerator, a pull-up mixer shelf, a baking center drawer, and a secondary sink for prep space. 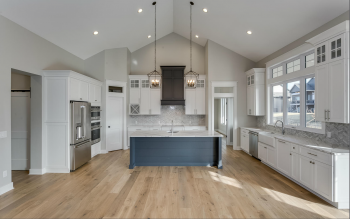 “There’s enough space for a family to sit around the island and enjoy each other’s company, while preparing meals,” says Nicole. 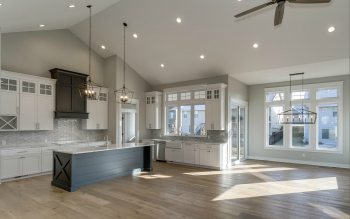 The kitchen is designed with an open floor plan into the dining room and living room areas. 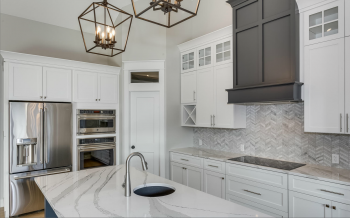 Cambria’s Britannica quartz and Elysium Wave Carrara Marble mosaic tile were chosen for the countertop and backsplash, respectively. “The multi-grey veining in the quartz was an instant match to the marble backsplash,” says Nicole. The floors are a warm French oak in the Malibu finish, a part of the Alta Vista collection from Hallmark Flooring. “I believe the kitchen is the true heart of this home,” summarizes Nicole. 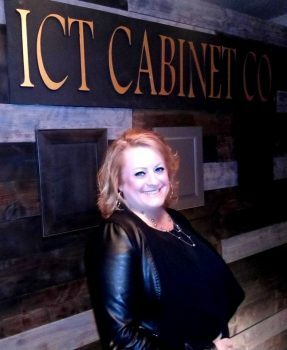 Nicole Zimmerman is the owner of ICT Cabinet Company, LLC serving Derby and the greater area of Wichita, Kansas. She offers cabinetry design services to builders, designers and DIY customers. In addition to being an exclusive Corsi Dealer in her area, Nicole is also a dealer for tile and hardware. She is a certified expert for living in place interior design. She has an Associate Degree in Applied Science in Interior Design from Wichita State University Tech. She is also a member of the Wichita Area Builders Association. 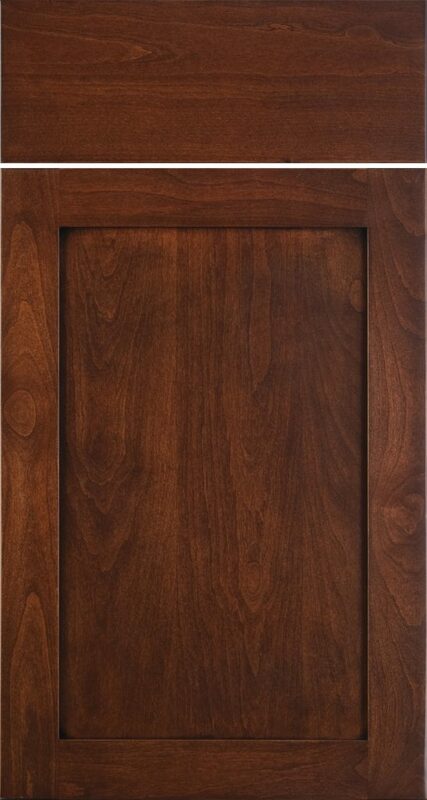 To learn more about ICT Cabinet Company, LLC, Click here. The builder for the project is A&E Construction. 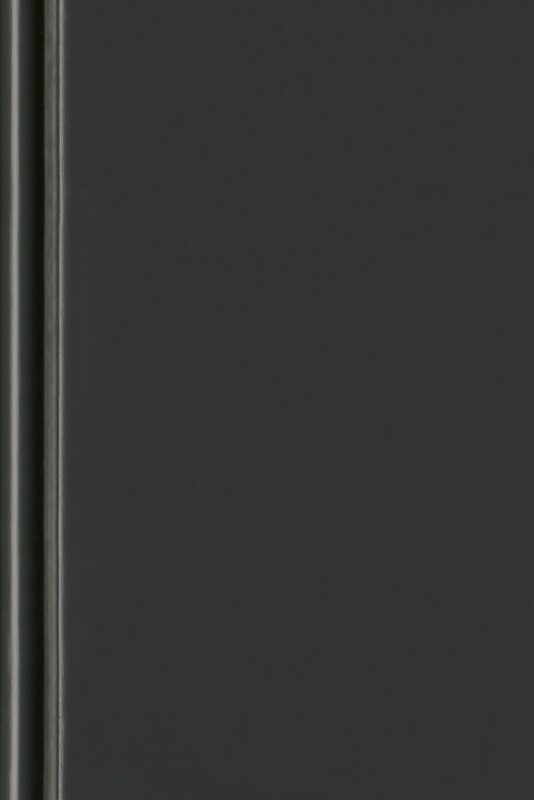 The countertops are provided Countertop Concepts by Don George. The flooring is provided by Designer’s Home Gallery. Photography courtesy of AE Real Estate® Photography.